Shirts With Random Triangles: New Trailer For Doctor Who Series Nine Finale "Hell Bent" released. New Trailer For Doctor Who Series Nine Finale "Hell Bent" released. Peter Capaldi as The Doctor. Image via companionsofthedoctor.com. 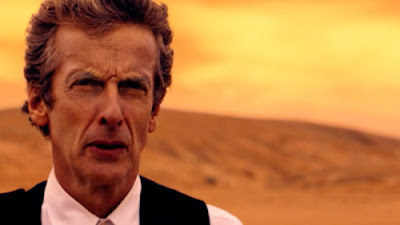 The BBC has released a new trailer for"Hell Bent," the Doctor Who series 9 finale. (They call television seasons "series" in Great Britain, because they're all British like that.) The closest thing to an appearance by The Doctor, however, is a request from the Time Lord's current portrayer, Peter Capaldi for viewers to subscribe to the Beeb's official Doctor Who YouTube channel. "Hell Bent" is the second part of the story that began in the previous episode "Heaven Sent." Here is what the BBC America website says about the episode. "Part 2. If you took everything from him, betrayed him, trapped him, and broke both his hearts, how far might the Doctor go? Returning to Gallifrey, the Doctor faces the Time Lords in a struggle that will take him to the end of time itself." "Hell Bent" will make its US premiere on Saturday, Dec. 5 at 9:00 PM.